Last night on the DL Show I mentioned a weather app called Eye in Sky Weather. Read on to see what makes this app good enough to be on two of my home screens. Eye in the Sky Weather (ESW) doesn’t have any standout features that you haven’t seen in a weather app before, but it does combine a lot of them into a beautiful, holo-themed package. For instance, ESW has the option for a persistent weather notification. When your notification shade is retracted you will see the current temperature in your notification bar in a brightened holo blue, but upon opening your notification shade you’ll see the temperature, weather conditions, cloud conditions, and how it feels outside next to a customizable icon that represents current conditions. When you open the app itself you’ll see the same information you found in the notification shade, but larger and including wind and humidity conditions. At the bottom of the main screen you’ll see a truncated forecast for the current day and the three following with high and low temperature and a a summary of weather conditions for that day (for example, I can expect some sprinkling on Saturday morning and some rain Sunday evening). A swipe to the right shows me the 48 hour forecast. The 48 Hours tab shows what to expect over the next two days in the morning, afternoon, evening, and night in terms of temperature, cloud coverage, and precipitation. A swipe to the left from the main screen shows the next two weeks of weather. This is an example of a way in which the app shines. A lot of apps show the next few days or the next week, byt ESW shows the next two weeks so you can really plan ahead if you need to. Obviously the further you look into the future the less accurate the weather information is, but if you’re planning a vacation for two weeks and you want to have an educated guess, this app gives it to you. The 15 day (it includes the current day) tab shows the highs and lows for each day as well as the chance of rain. What Android app would be complete without a little bit of customization options? Eye in the Sky Weather doesn’t leave you hanging. Aside from the option to add as many cities as you want to toggle between, ESW lets you choose between Fahrenheit and Celsius for temperature, kilometers per hour, miles per hour, meters per second, and knots for wind speed, and centimeters, millimeters, and inches for rain or snow measurement. ESW also has twelve different icon sets that you can choose between for in the app, on a widget, and in your notification bar (yes, you can have three different icon sets for each item). The twelve icon sets mostly follow a metro or holo like design language with some coming in monochrome, some in light colors, some in more descriptive colors, and one (realistic) in extreme color and detail. Every icon set looks great and scales well across the different sizes. ESW comes with four different widget options. The first is Cities, seen above, which shows you the weather for the next few days in every city you have added to the map. To toggle between cities, simply press the arrow button on either side of the widget. Next is Forecast, which is a 4×1 widget showing the forecast for the next five days. The icon widget does what every iPhone owner wishes their weather app could do – show the current temperature and conditions in the icon for the app. Finally, Temperature is an icon sized circle that simply tells you the current temperature. 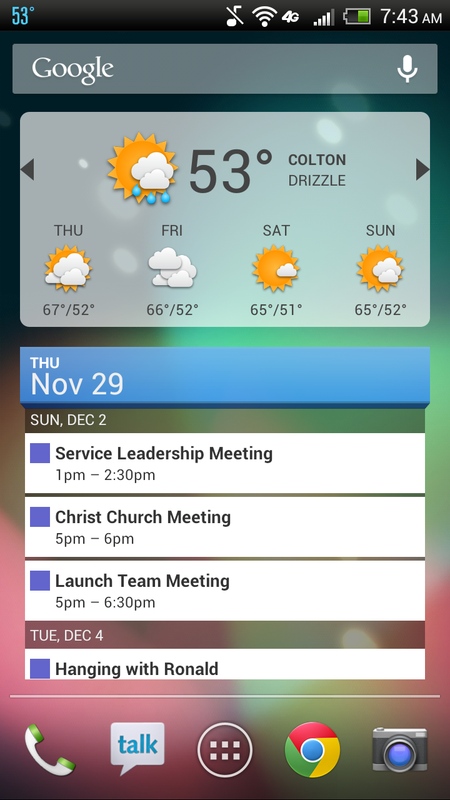 All of these widgets come with optional refresh and edit buttons on the widget, text color options, background color options (including transparency), and location options. Eye in the Sky Weather has taken over my homescreen. It is my app of choice for accurate weather information not only because it gives me everything I need in a weather app, but because the design is beautiful and customizable to my liking. Android has a history of having apps that are great at giving you information, but lacking in the design department. Eye in the Sky Weather gives accurate information in a gorgeous package. Instead of making all of the design choices for you, the developer, Tim Clark, provides beautiful icon choices to let you have the look that you want. Eye in the Sky Weather is a free, ad-supported app in the Google Play Store. For $1.91 you can remove the ads. The app is universal so it will work on both phones and tablets and Clark promises a 7-inch version is coming soon. Download Eye in the Sky Weather here.